“ROOTS” have revived with new technologies. 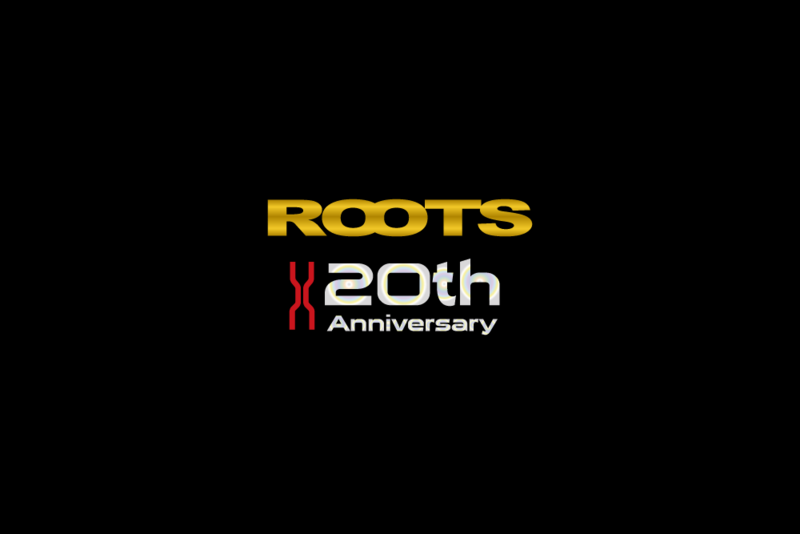 Since 1998, ROOTS series has been released 20 years.For 20 years anniversary model, we named “CHRONICLE” as a meaning of “annals” in retrospect of ROOTS development.Please look at revived ROOTS with latest technologies. 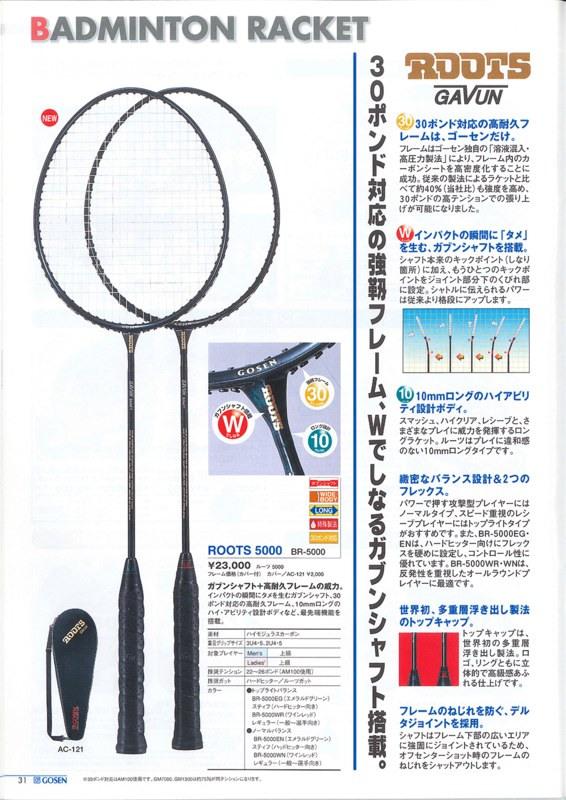 “GAVUN shaft” which is world-first invented shaft technology that has developed for double kick point of golf shaft. 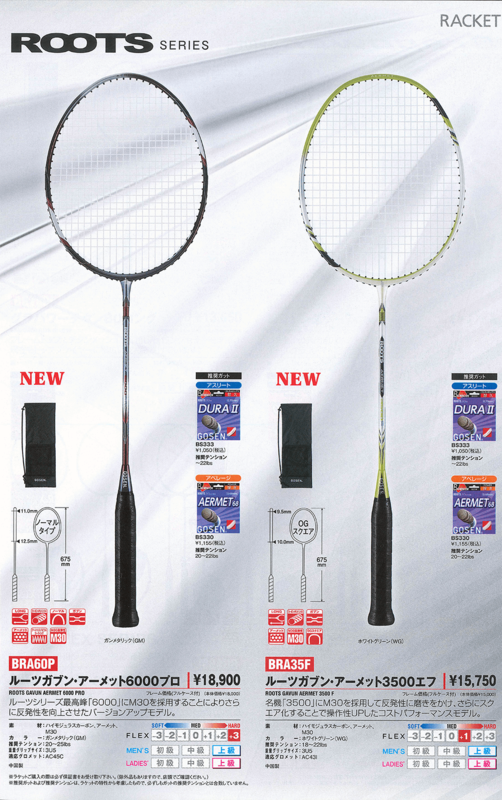 This has been applied to ROOTS badminton racket. 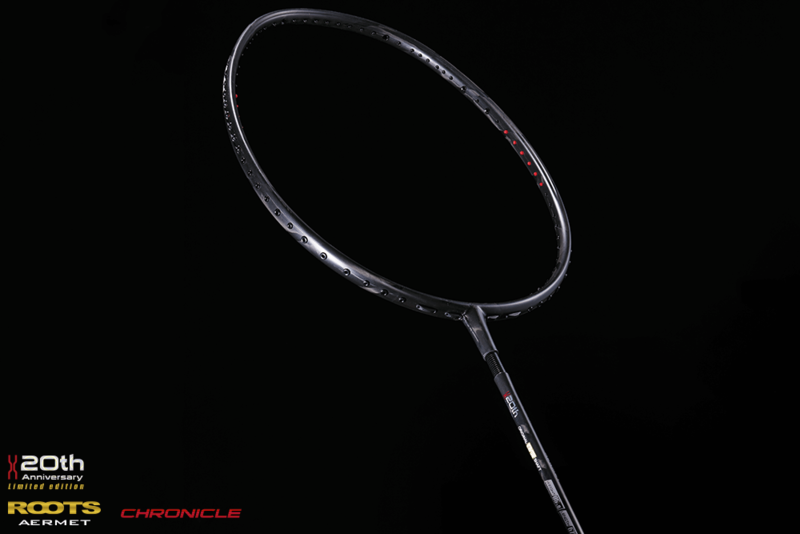 It became a sensational racket because of high durable frame and “DELTA JOINT” structure to prevent the torsion of a frame. 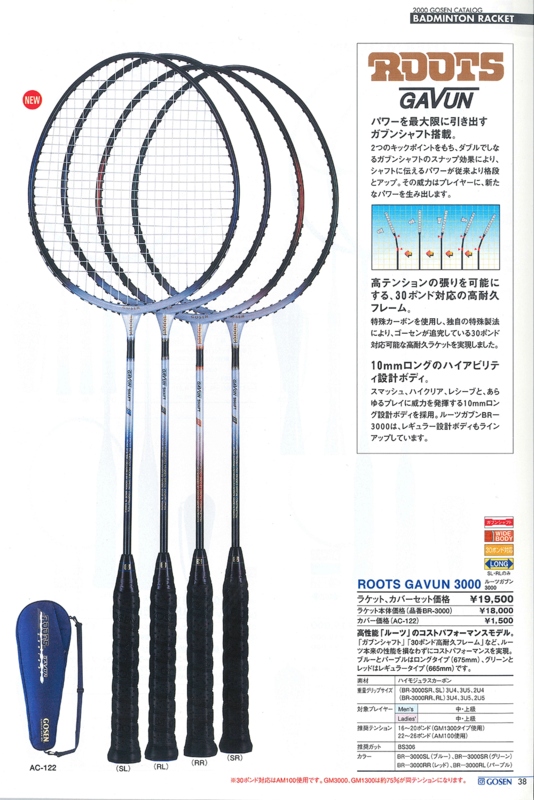 The first ROOTS series “ROOTS 5000” in 1998, was followed and repeated by many fans because players could choose their favorable racket weight balance and shaft flexibility. GOSEN had signed a sponsorship contract to Badminton Association of Malaysia (BAM). 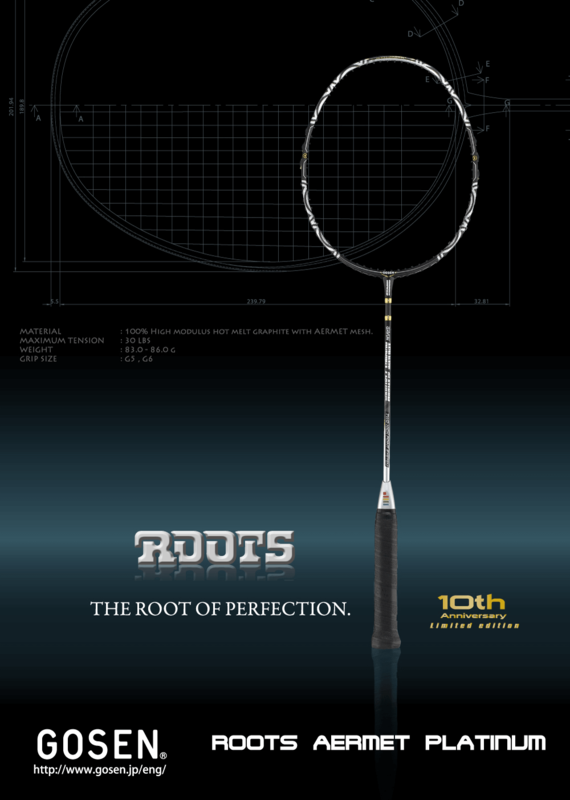 “ROOTS 5000 PRO” has been developed as a special model for the national team.ROOTS series took this opportunity and became well-known racket as a high-end model. On the other hand, GOSEN released “ROOTS GAVUN 3000” as a popular edition. This model became popular with players because they could choose their suitable length and weight balance, and shaft flexibility. Since GOSEN had a contract with an official team of Malaysia, ROOTS got sophisticated more. 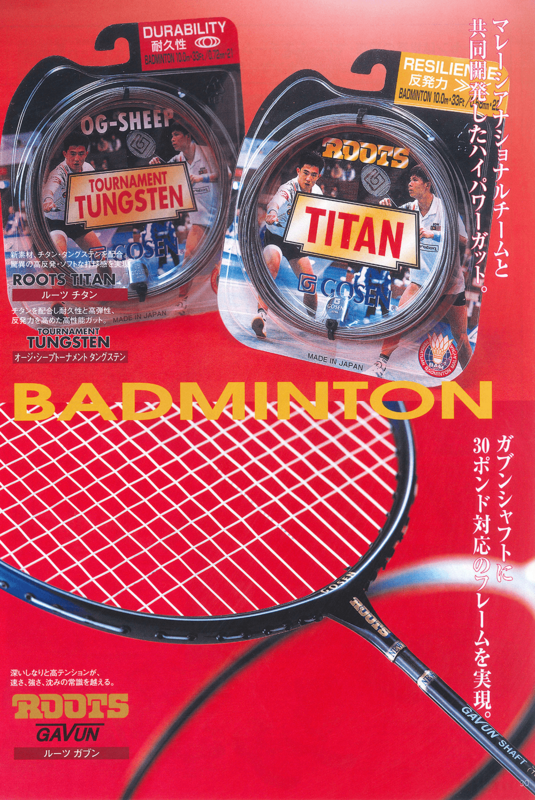 “ROOTS GAVUN TITAN 5000” could increase face stability by applying “titanium mesh” to both sides of a frame, which was unique material at that time. 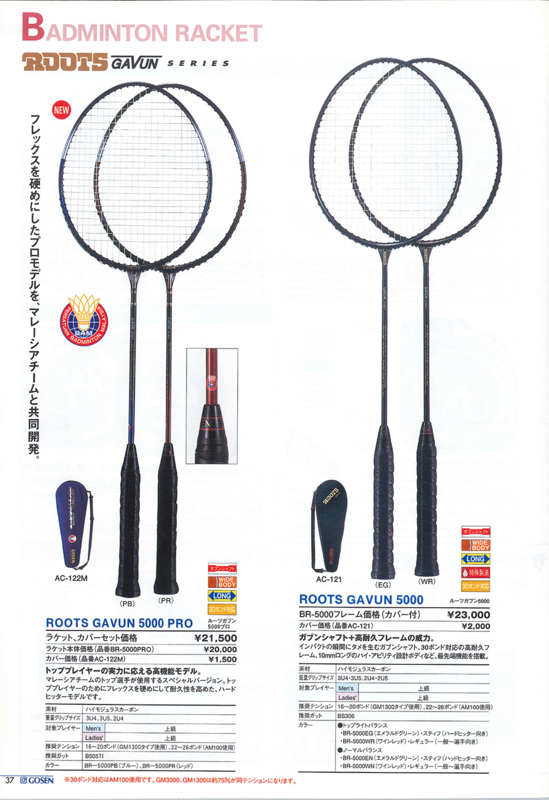 In addition, “ROOTS GAVUN 4400” which has the square shaped frame, had been released for female players. Titanium is lightweight and firm metal material. But “AERMET ALLOY” exceeds titanium in strength. 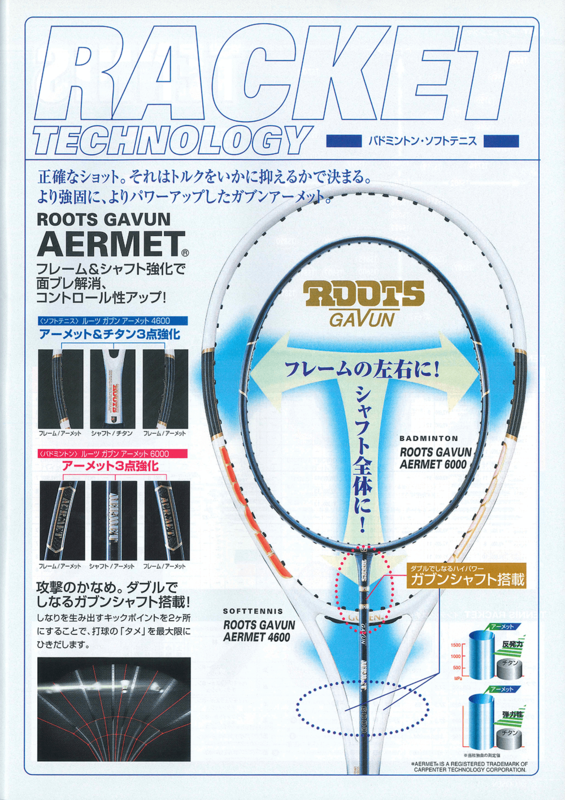 “ROOTS GAVUN AERMET 6000” has been developed and it transcended previous model ROOTS GAVUN TITAN 5000, and it became a long seller. AERMET ALLOY has been applied to ROOTS series since 2002. 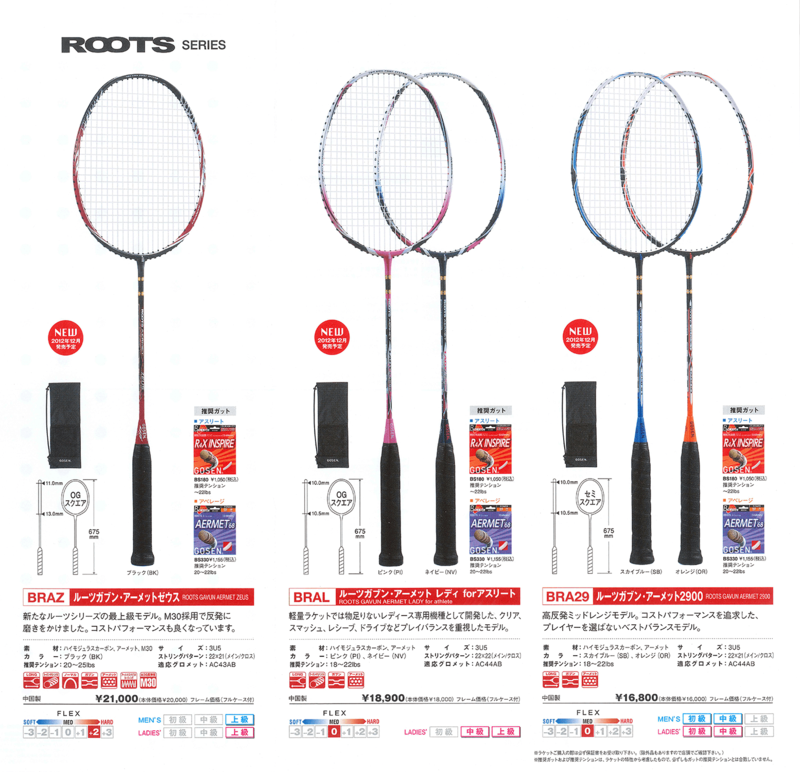 And it is also applied to latest ROOTS series rackets too. 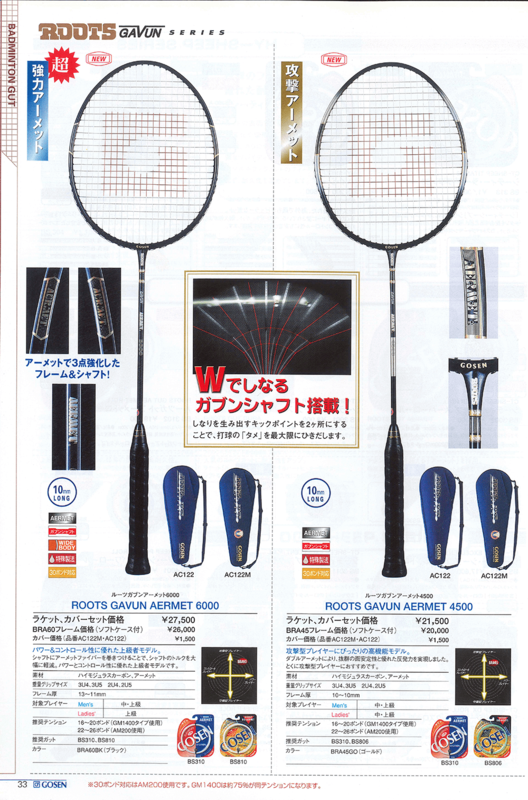 GOSEN approached ROOTS from new perspective compared to past production method, and developed new racket, “ROOTS GAVUN WPP AERMET 5300”. 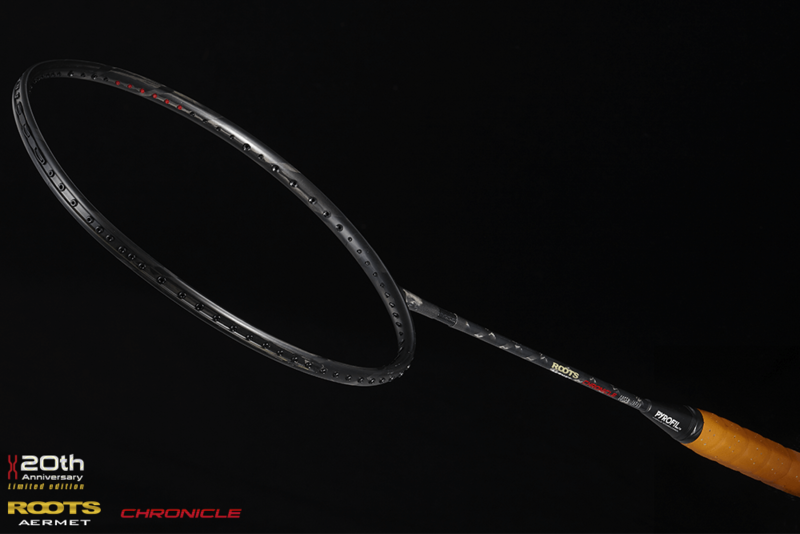 “WPP (Wave Power Performance)” makes concave on the both sides of the frame to enlarge the string area and increase resilience. To produce this complexed frame shape, GOSEN applied the top-ranked molding technology. 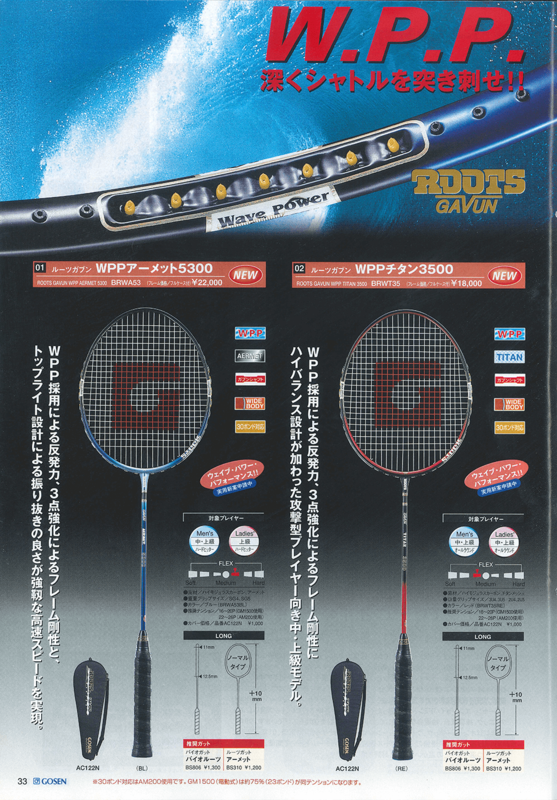 “ROOTS GAVUN WPP AERMET 3500” has also released as an entry model, and it became long seller by offering the color variations. Since 2005, ROOTS series global line-up had more variation. 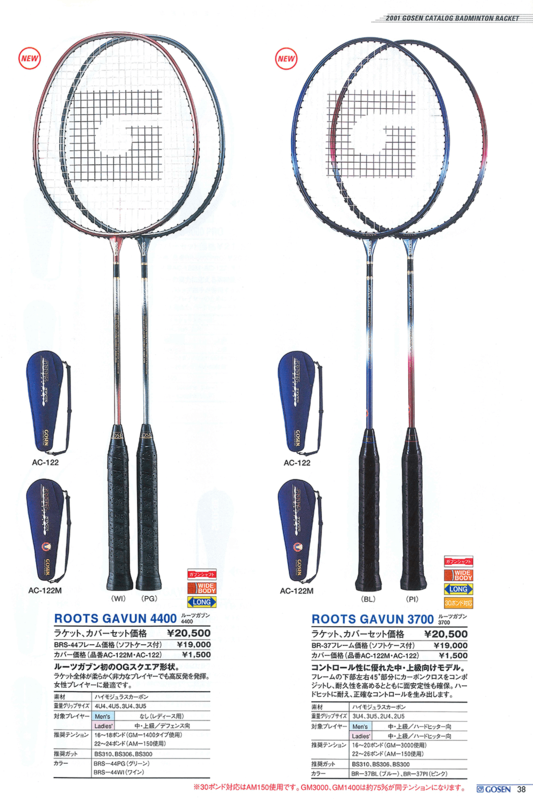 High-end global model, “ROOTS GAVUN AERMET 6900” was also released in Japan market and attracted many Japanese players by unique color and design of overseas ROOTS model. 10 years had passed since ROOTS series released to market. The first-anniversary model, “ROOTS GAVUN AERMET PLATINUM” was released. This model had rich design and developed for global model as a concept of in pursuing the ultimate playability befitting as a name of platinum. 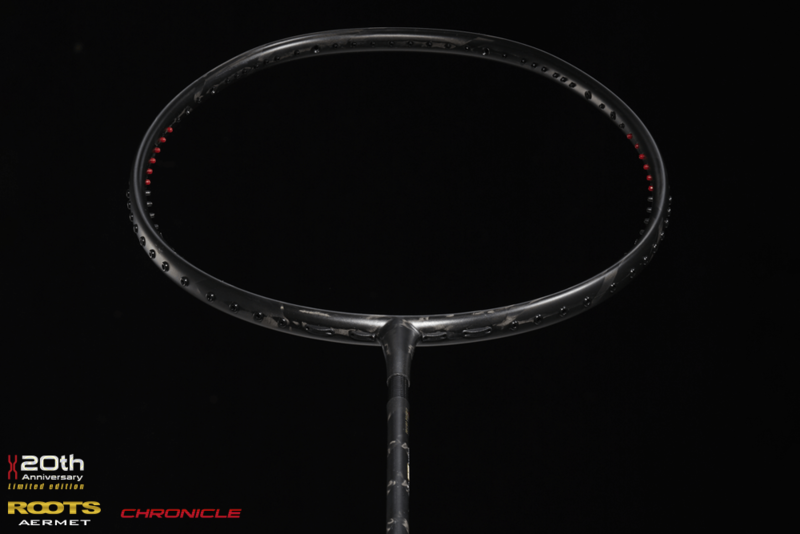 This racket is the first model that applied “carbon see-through coating”. By using carbon see-through coating instead of a standard coat, it has solved dull hitting feeling and brought out the maximal potential of resilience. 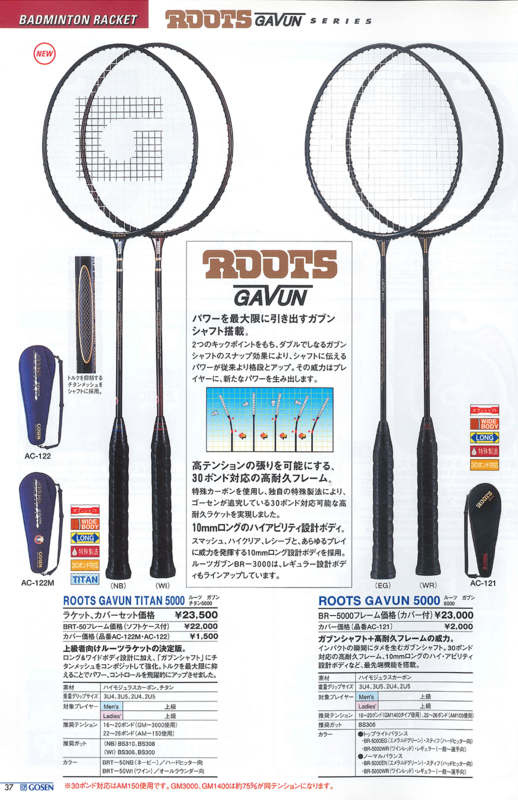 ROOTS GAVUN AERMET 6000 had released for revival model of 2002. 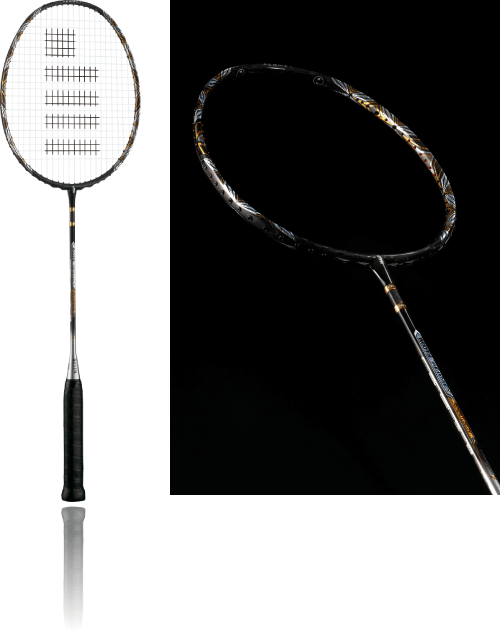 Production method and racket shape was same as an original racket, but with renewed carbon material and top cap. 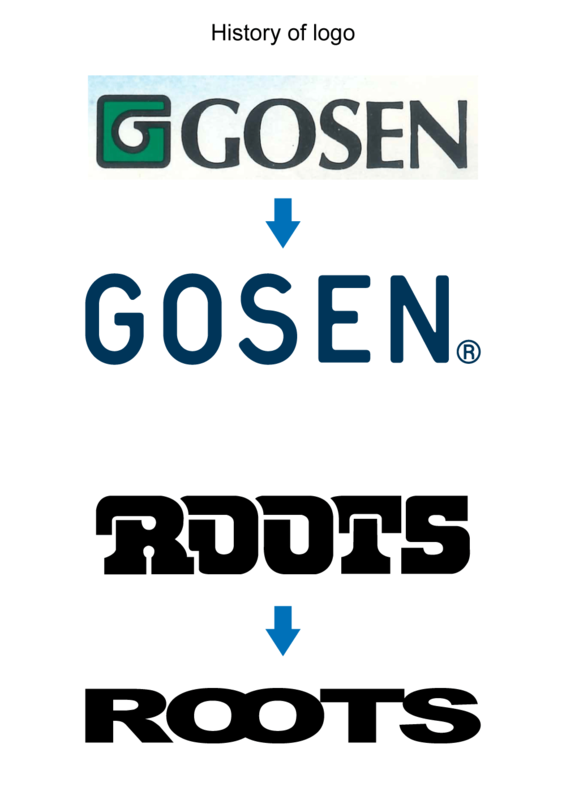 While the company logo has been renewed, the logo of design of “ROOTS” was also renovated. 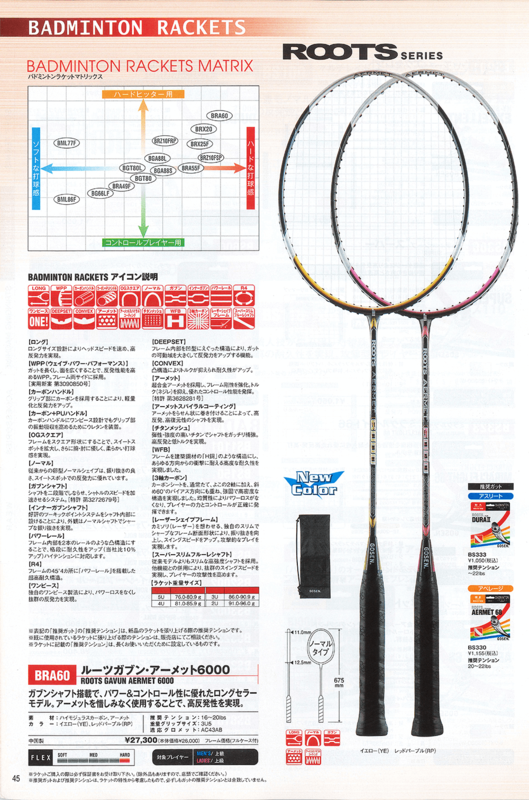 Stringing tension of badminton racket has been getting higher. GOSEN applied high-strength carbon material “M30” to ROOTS GAVUN AERMET 6000 and ROOTS GAVUN WPP AERMET 3500, without changing speculation to release upgrade models, “ROOTS GAVUN AERMET 6000 PRO” and “ROOTS GAVUN AERMET 3500F”. 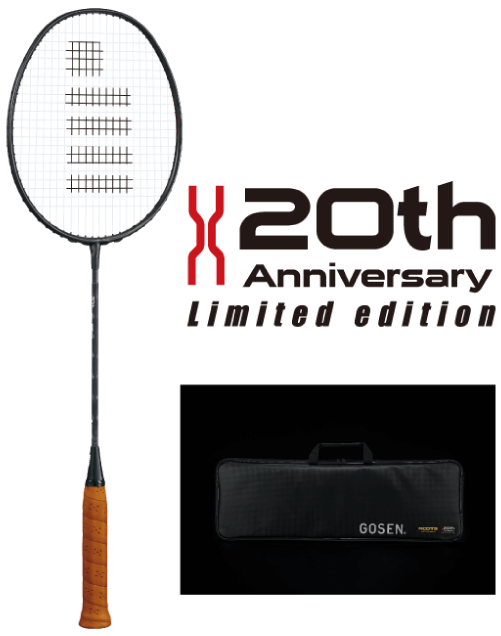 GOSEN had released new ROOTS models that targeted male, female and entry level players. 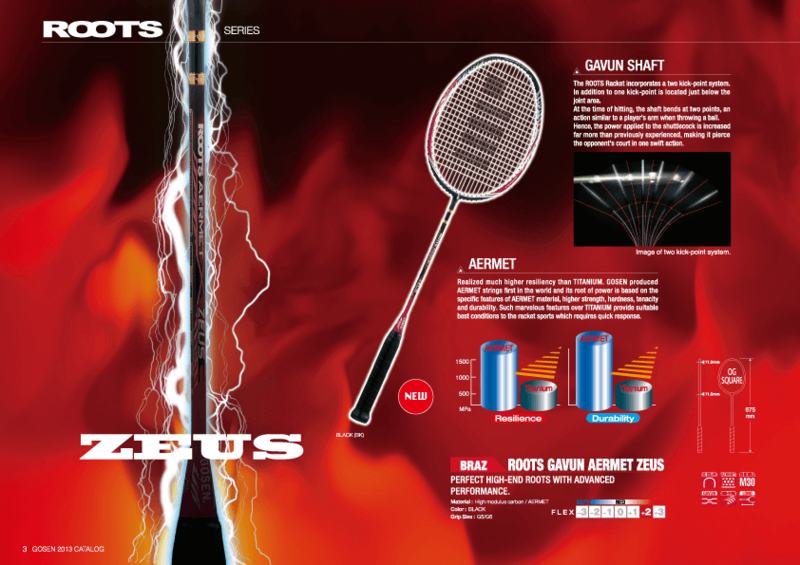 “ROOTS AERMET ZEUS” has been developed for flagship model. GOSEN applied carbon and polyurethane resin handle instead of using wooden grip to maximize resilience. “ROOTS AERMET SMARTRON” has developed for global model, which was acceded model, ROOTS AERMET PLATINUM in 2008. “ALL HOT MELT CARBON processed prepreg” has been applied to this model. By applying this carbon sheet, GOSEN attempt to stabilize strength of frame and disperse stress by high tension stringing. Moreover, because the speculation 3grams lighter than the conventional racket realized better playability to receive huge support from fans and repeaters. 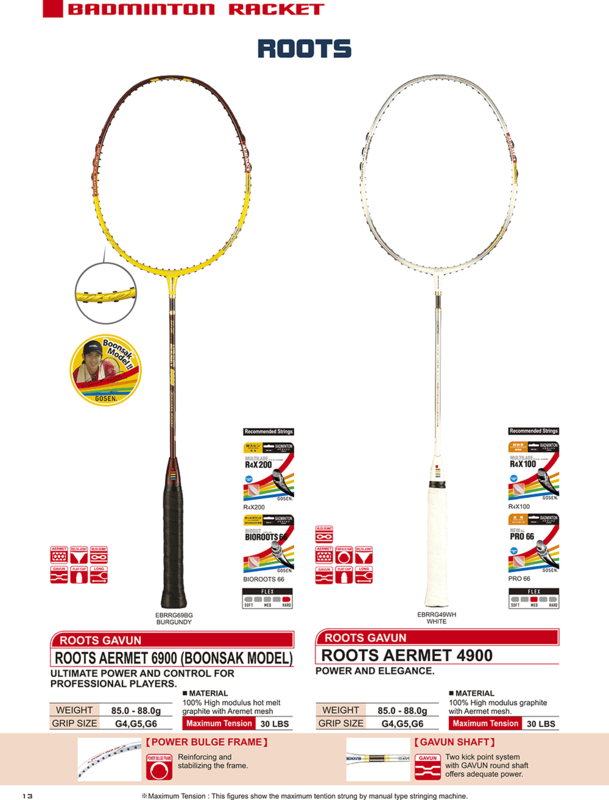 ROOTS have been reborn again with latest carbon technology and it was named “ROOTS AERMET CHRONICLE”. 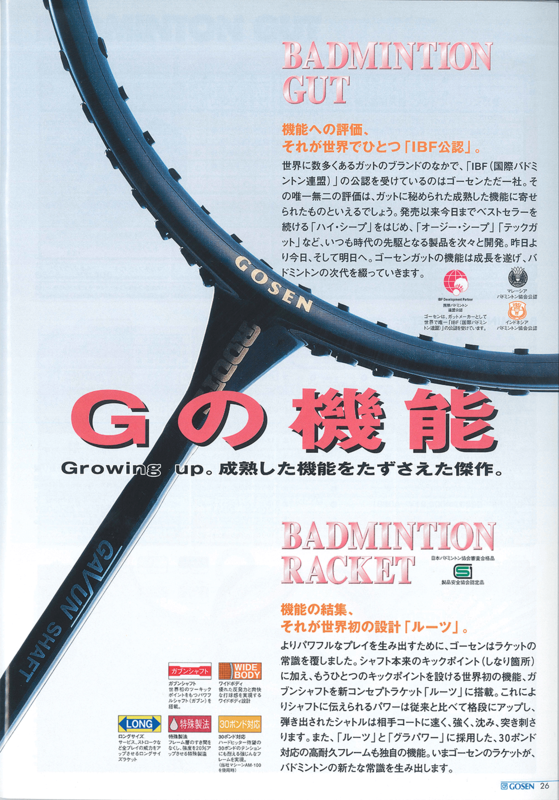 For carbon sheet, GOSEN applied Mitsubishi Chemical PYROFIL as same as “INFERNO” series, and to bring out rackets original speculation as maximum level, we applied carbon see-through coat. 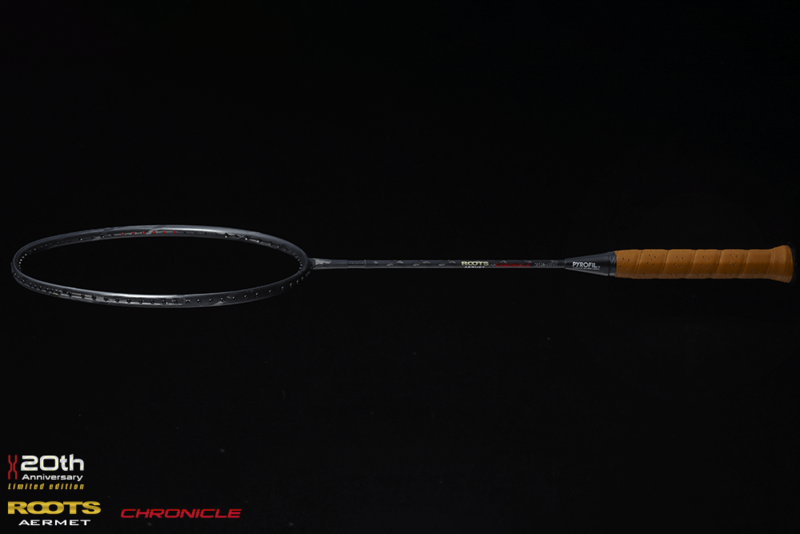 Real leather over grip and special racket case come with this racket to make as premiere 20th anniversary model. ※PYROFIL is the registered trademark by MITSUBISHI CHEMICAL CORPORATION.